that includes a fridge, coffee machine and a kettle. A TV and small dining area are also standard. Kindly note that guests staying more than 7 nights are offered a group B car for 24 hours, free of charge. Opening to a furnished balcony, this air-conditioned studio has a kitchenette that includes a fridge, coffee machine and a kettle. A TV and small dining area are also standard. 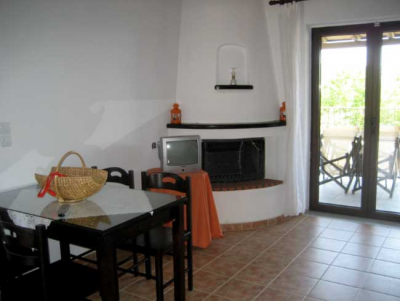 Loft Apartment with Village View for 3 - 4 Pers. Featuring a loft, this air-conditioned apartment opens to a furnished balcony with views over the village. It has a Kitchenette without hotplates that includes a fridge, coffee machine and a kettle. A TV and small dining area are also standard. 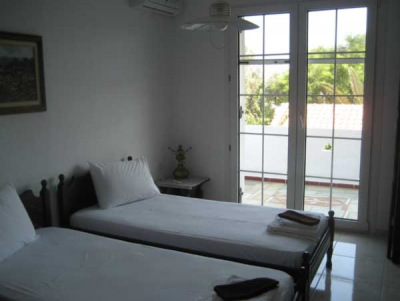 Two-Bedroom Apartment with Garden View for 4-5 P.
Beds: 4 single beds, 1 sofa bed. and a living room with fireplace. Common BBQ facilities and an outdoor shower can be found in the garden. Please note that the kitchenette can only be used for the preparation of light meals. B) 68 days before arrival, we charge 50%, which is the redemption. If canceled 88 days before arrival, we charge 25% of the total price of the reservation. If canceled from 87; 59 days before arrival, we charge 50% of the total price of the reservation. If canceled or modified from 0-58 days before arrival, we charge 100% of the total price of the reservation.